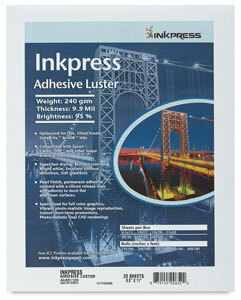 These high quality papers from Inkpress are compatible with all inkjet printers. Inkpress Adhesive Luster — Compatible with all inkjet printers, this 9.5 mil thick, 240 gsm paper is bright white with a pearl finish and an adhesive backing. It reproduces vibrant photo-realistic images that are true in color, with soft gradients and excellent contour definition. Other features include a PE extruded microporous coating and a silicon release liner. The adhesive backing on this fast-drying paper makes it ideal for short-term indoor promotions. It comes in three sizes, 20 sheets per pack. Inkpress Transparency Film — Inkpress Transparency Film is a 5 mil, dimensionally stable polyester film with a clear microporous topcoat specifically designed for use in creating screen positives and negatives with dye or pigment inkjet printers. Inkpress Luster — Luster is a premium-quality, high-resolution, bright white photo-grade paper designed for the highest-quality color images on both dye and pigment inkjet printers. Luster's microporous, ultra-absorbent resin coating allows UltraChrome and other pigmented inks to dry instantly, preventing puddling and black (shadows) from highlighting or laying on top of the paper's surface. 240 gsm. Inkpress Pro Silky — Pro Silky is an outstanding surface that allows handling without fingerprints or artifacts. Gloss and surface reflectance of the silky finish remains the same in printed and unprinted areas when using pigmented or dye inks. Other features include high saturation with dye and pigmented inks, true color fidelity (especially skin tones), excellent chromatic reproduction and huge tonal range, outstanding black-and-white reproduction, high D-max and perfect gray balance, and perfect shadows and fine-line detail. 300 gsm. Inkpress Proofing Matte — This is a white, single-sided, matte finish paper that is extremely economical and perfect for everyday printing at resolutions up to 2880 dpi. It features good ink absorption, with excellent sharpness and color gradation. It’s also fast-drying, lightfast, acid-free, and lignin-free. 90 gsm. Inkpress Luster Duo — This paper offers the high quality and superior performance of Inkpress Luster Paper in a double-sided version. Luster is a premium-quality, high-resolution, bright white photo-grade paper designed for the highest-quality color images on both dye and pigment inkjet printers. Luster's microporous, ultra-absorbent resin coating allows UltraChrome and other pigmented inks to dry instantly, preventing puddling and black (shadows) from highlighting or laying on top of the paper's surface. 300 gsm. Inkpress Glossy — This premium-quality, heavyweight, resin-coated paper has a real photo feel, ideal for extremely high-resolution printing up to 5760 dpi with sharp details and brilliant colors. It is lightfast and dries instantly with no smudges or smears. 240 gsm. 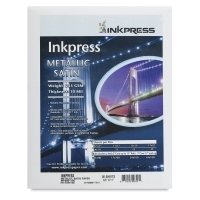 Inkpress Matte 60 — This white, single-sided, matte finish paper is suitable for high-resolution printing up to 5760 dpi. It features extremely good pigment and dye absorption, dries instantly, and is water-resistant. It is also lightfast, acid-free, and lignin-free. 200 gsm.